A collection of narrative paintings and art book touring 2015-2018 and beyond. 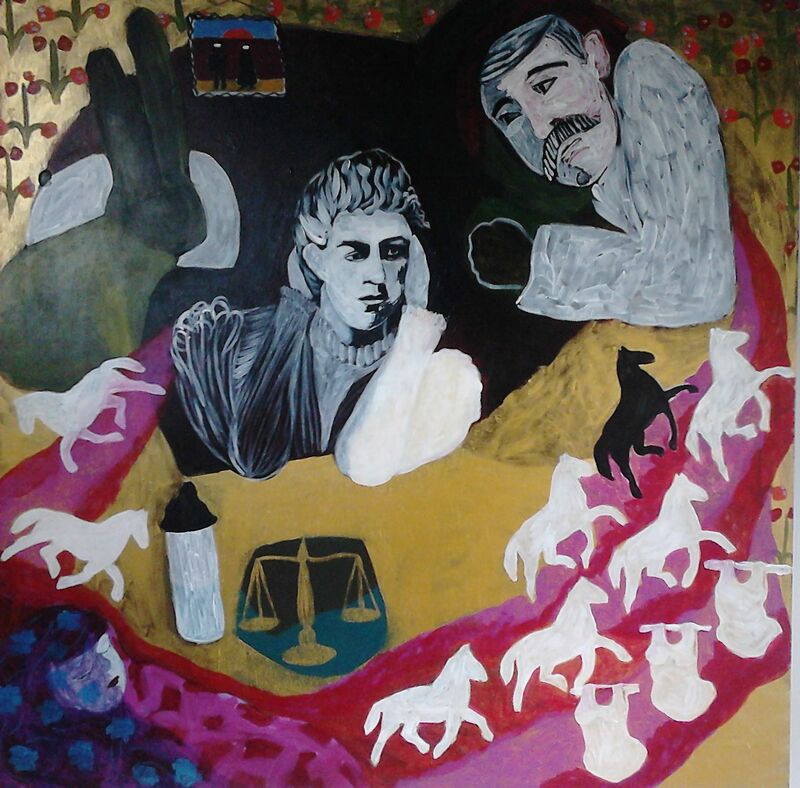 Rebecca Wilson’s travelling exhibition and book has just returned from London.Rebecca was invited to exhibit her Kate Kelly works in London at the Parallax Art Fair, July 2018.The Kensington Central Library in London hosted Rebecca’s talk on her research, paintings and book, Kate Kelly: Sister of an Outlaw. baby and three young children. Her body was found eight days later in Forbes Lake. Kate’s life was filled with tragedy, overtaken by exceptional events. She married William “Bricky” Foster in Forbes when she was pregnant with their first child. An excellent horsewoman, she rode as a decoy for the Kelly gang and was known for delivering supplies and ammunition when the gang was hiding-out. She even once took a bullet, according to “Bricky’s” relatives. She became a celebrity after her infamous brother Ned Kelly was hanged in Melbourne Gaol in 1880.After the Kelly gang’s demise, Kate travelled widely with her older brother Jim, performing on horseback and exhibiting weapons and other Kelly memorabilia, until she moved to Cadow Station near Forbes to escape the limelight. Kate’s life ended abruptly at the age of 36. She was found dead, possibly through suicide, in Forbes Lake about a week after she had been reported missing. Kate’s surviving brother Jim collected her three remaining children (three others had died) and “Ma Kelly” (Ellen) then raised her grandchildren at Eleven Mile Creek. Maggie dies in Victoria, far away from her beloved younger sister, Kate. At this stage in Kate’s tumultuous life, she had already lost her father, two sisters, two brothers and two of her children. Kate had been very close to Maggie. She reportedly spoke of suicide after Maggie’s death. 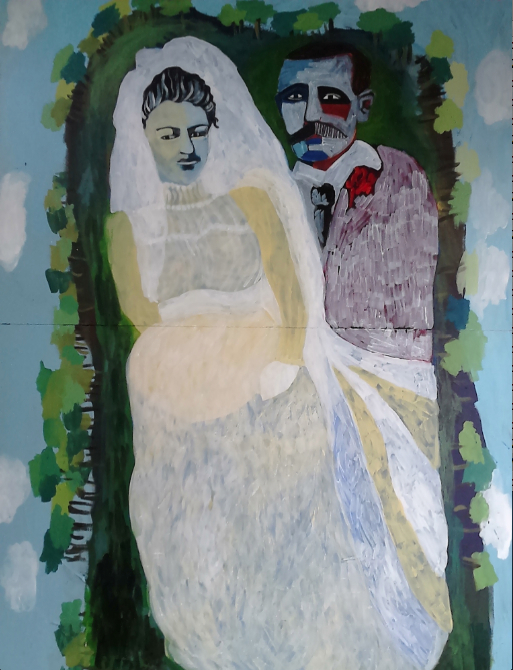 Artist Rebecca Wilson grew up in Forbes, where Kate Kelly spent the final years of her life and it was Rebecca’s relatives who gave Kate Kelly, then known under the alias Ada Hennessey, her first job as a domestic servant at Cadow Station. Wilson has deep family roots in the Central West. She is a descendant of the pioneering couple Pierce and Mary Collits, who founded the famous, heritage-listed Collits Inn at Hartley Vale at the western edge of the Blue Mountains. It is well known that Pierce Collits, who had been transported to Port Jackson from London in 1801 for receiving stolen goods, had many connections with bushrangers in his days running the Inn. It is likely that the Collits’ and their descendants had closer dealings with the Kelly gang than is fully recorded. of illustrations, engravings and articles about public and social life and events. 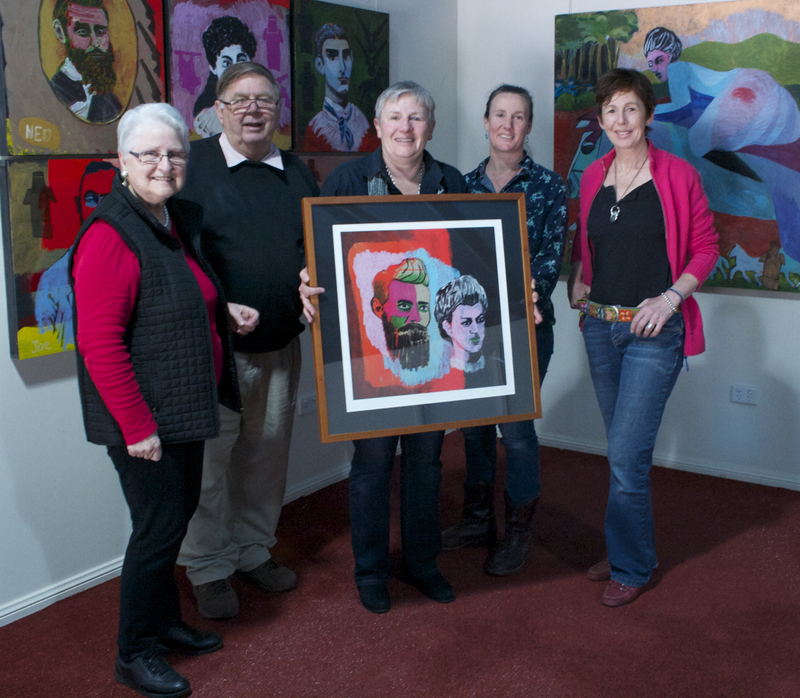 Wilson’s portraits are partly based on illustrations and vintage black-and-white photographs of key players in Kate’s life – her mother Ellen, her husband “Bricky”, her sisters Grace, Maggie and the eldest Anne (who died giving birth to a policeman’s baby while her husband was in gaol), her brothers Dan and Jim, fellow gang members Steve Hart and Joe Byrne, and Constable Fitzpatrick, who the artist strongly believes may have been the father of one of Kate’s children. Through ongoing research, Wilson asserts that Kate’s sister Alice, was possibly her daughter instead. Kate, Maggie & Grace Kelly surround their injured brother in Glenrowan, after he had been shot. In a letter donated to Melbourne Library in 2012, an eye- witness describes the Kelly sisters wailing in the street and Kate with her arm around Ned’s neck. Wilson’s larger landscape paintings depict crucial events in the Kelly saga, as well as intimate daily scenes. 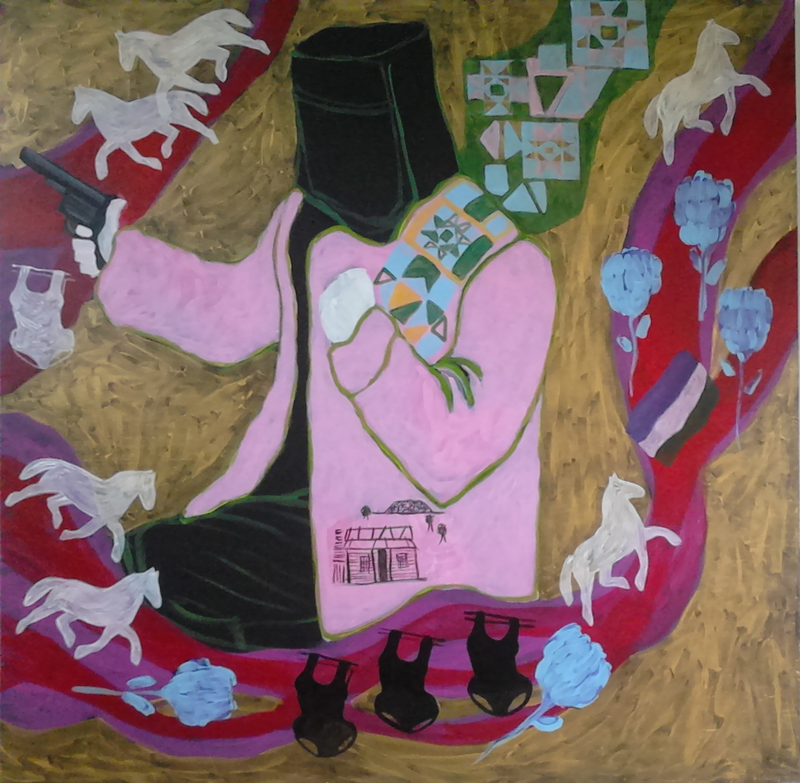 The broader settings include gold-fields, maps of the town of Glenrowan where Ned Kelly was ambushed, Cadow Station near Forbes superimposed with ancestral faces, and Kate breaking-in colts, or riding a horse through bushland as a decoy for the police. Wilson portrays images with highly charged emotions. We see the dubious joy of Kate’s wedding day to “Bricky”, Kate visiting the Governor to ask for mercy for Ned, the death of her sister Maggie, and the corpse of Kate floating in the lake. 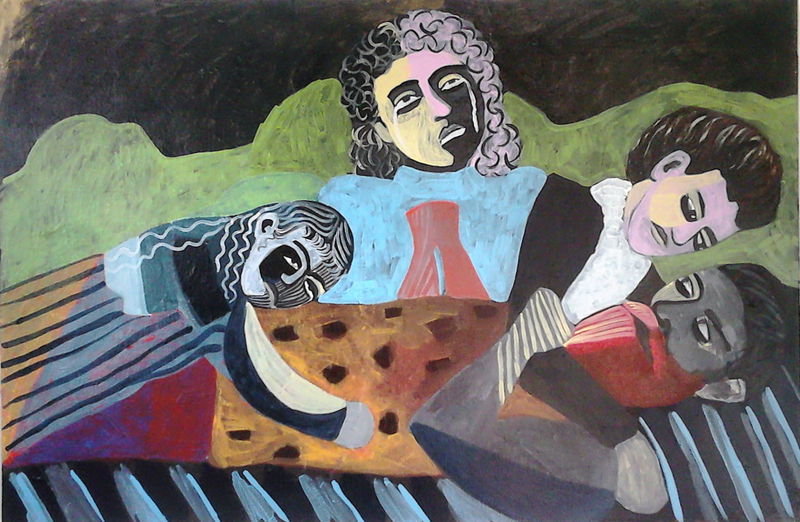 The nucleus of this travelling show for 2015 consists of about 40 paintings, and will be adapted to each venue, and supplemented by archival material. After Blackheath, the exhibition will travel to Bathurst’s Wholefood Kitchen & Gallery in June, the Leichhardt Library in Sydney in July, the TAFE College March St Campus in Orange from September 1 and finally to the Rosie Johnston Gallery in Forbes from September 21– October 31. The Lachlan-Kalari River Arts Festival is organizing aligned events and exhibitions around Forbes from October 30-31. 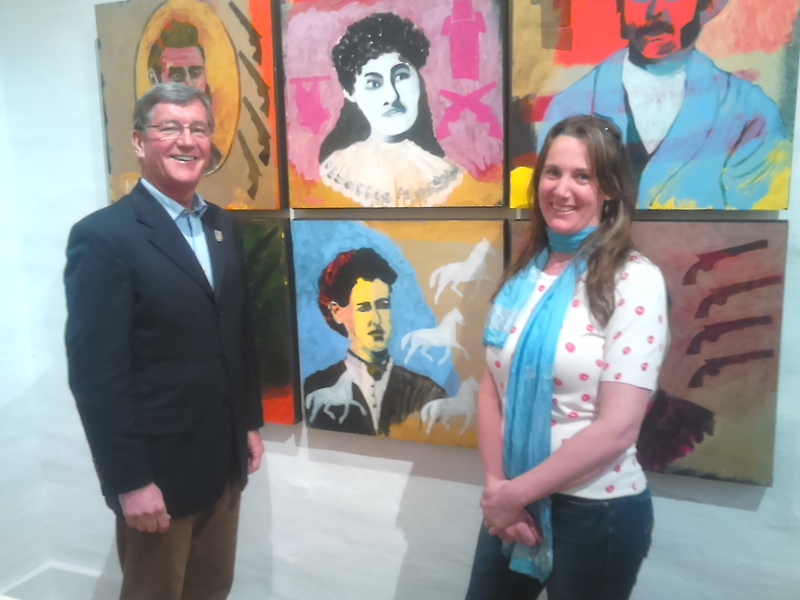 The show appears in 2016 at Grenfell Art Gallery. See beow for a link to their website. A graduate of the National Art School in 1997 and the College of Fine Arts in 2002, Rebecca Wilson has twice been a finalist in the Blake Prize at the S.H Ervin Gallery in 2001 and 2007 and the accompanying exhibition tour in 2001-2. 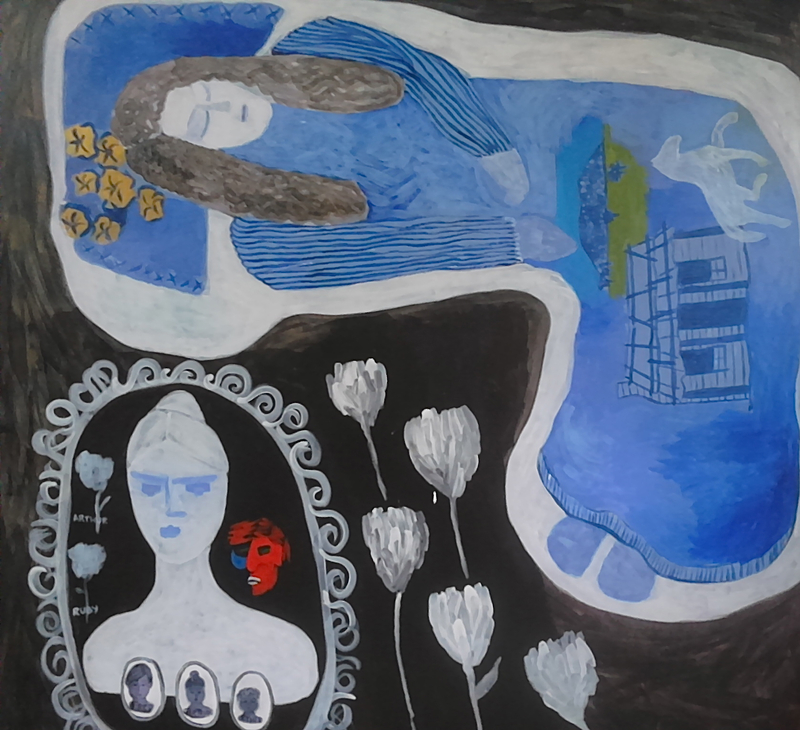 Her solo show Australianism, 2007 was held at Mary Place Gallery in Sydney, and she has previously exhibited at various galleries in Australia and overseas. Recently, Wilson completed a residency at the famous Red Gate Gallery in Beijing, China. Her Kate Kelly work has been in The Sydney Morning Herald and The Age in Melbourne and she has appeared on TV to dicuss her research, paintings and book. 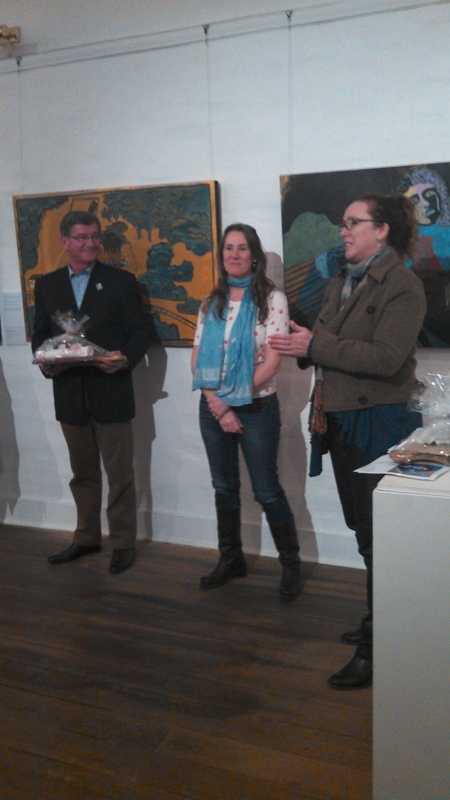 Her works are included in the annual group show and open studio trail at the Jean Bellette Gallery in Hill End. As a guest lecturer she has focused on colour theory & art history at institutions in Thailand and she currently teaches at TAFE Western Institute in the Central West. 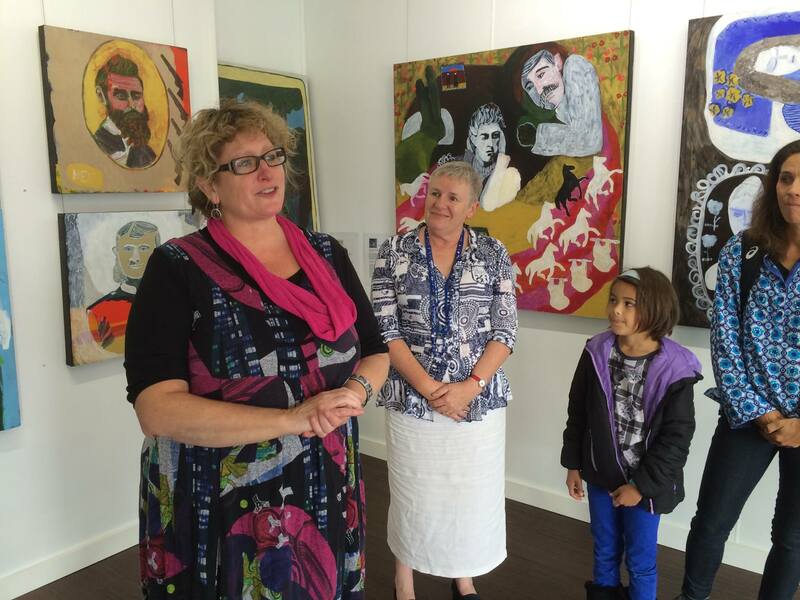 17 June – 31 July 2016 Thanks to the wonderful team at Grenfell Art Gallery! 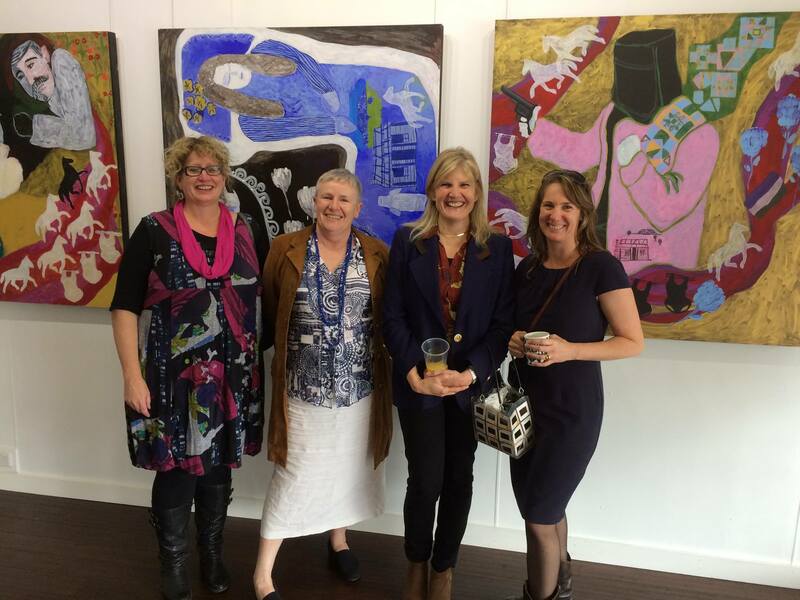 Pictured are; Ginni and Di; installations, Rebecca Wilson; artist, Claire Myers; Information and Tourism Officer and Carly Brown; Grenfell Council’s delegate for Arts OutWest. It’s great people that make things work well! 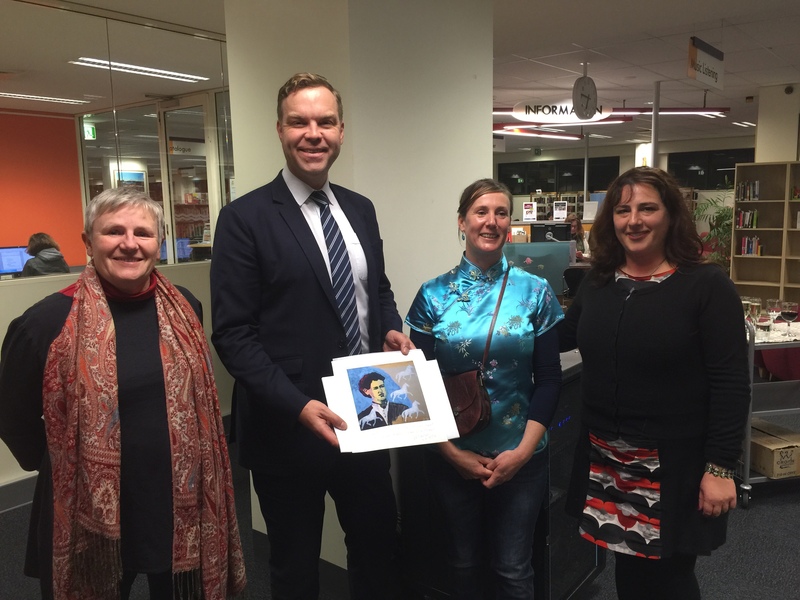 Leichhardt Opening Event 2015 – Mr Jamie Parker, Greens Member for Balmain and former Mayor of Leichhardt with Margot Jolly, President of the Kalari-Lachlan River Arts Festival, artist Rebecca Wilson and Curator at Leichhardt Library Amie Zar. Thank you to each of them for their support. You can see more at facebook.com/rwilsonart. Blackheath Launch Event – Tracey Callinan Arts OutWest EO, Margot Jolly River Arts Festival President, Liz Bastian Arts Specialist and artist Rebecca Wilson. 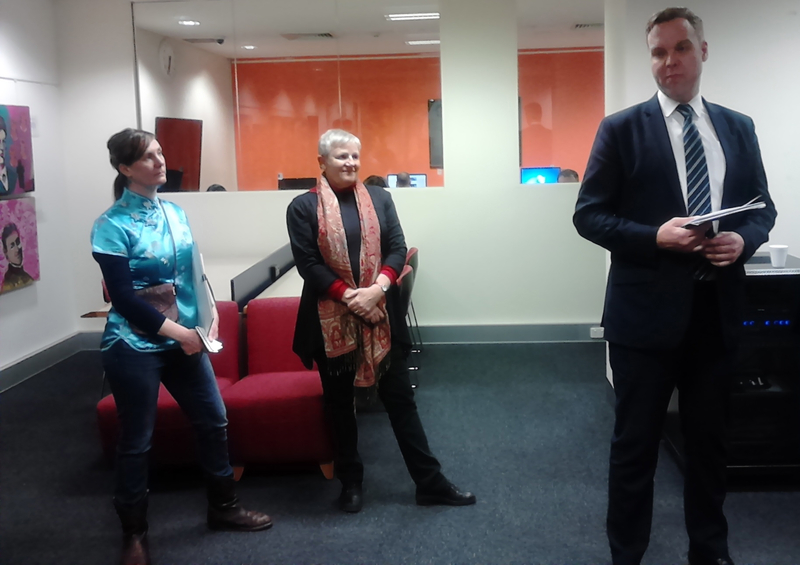 Tracey and Margot pictured giving speeches to launch the Kate Kelly: Sister of an Outlaw Travelling Exhibition. Thanks to Kalari-Lachlan River Arts Festival and Arts OutWest for all their support and assistance.